We’ve had the pleasure of getting to know many homebrewers, as well as craft brewers, in the past year and a half. Many of them endure the waits at the border to come across for brew supplies, and they are working hard to build a thriving beer scene just south of the border. Last month I had the honor of walking across the border with Joey from Bine Vine, Ryan from Coronado, and Larry from Firestone Walker (formerly of Home Brew Mart, and also a bit currently of Pizza Port, of I’m not mistaken). Together we comprised the first team of judges to oversee The Tijuana Homebrew Club’s inaugural homebrew competition. The categories were American and IPAs. The beers themselves resembled the same mix of experience and quality that one would expect from a competition in the states: mostly solid, a few in need of process improvements, and a handful of fantastic examples. Our hosts were the crew at Beer Box. They treated us to a wonderful meal at the TJ Food Garden. We also had the pleasure of visiting Sospeso Coffee and Baja Craft Beer. The walk across The border took about 20 minutes. Certainly looking forward to many more visits to our neighbors in the future. Some photos from this trip are below. So We’ve been rearranging a lot lately. Mostly because we like it when you guys/gals comment on how different it looks, and we’re afraid that you wouldn’t talk to us if you didn’t have to ask where the Special Roast has moved to. 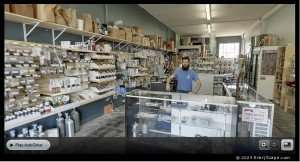 So in our latest addition of “How much have we arranged in 2 weeks?” We’d like to present to you our digital walk-through of the shop. It’s pretty cool, George looks like a dork, and we’ve already moved a few things around, so next time you come in we are guaranteed that you will be forced to talk to us!! George will still look like a dork though. That won’t change, sorry. 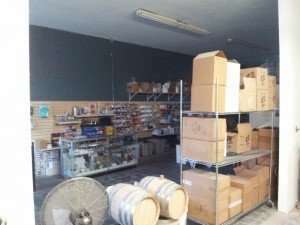 Good news as far as progress towards expanding our store to include an education focused brewery and tasting room. Next time you are in you will notice the large hole in the wall. This will be where the tasting area will go. Behind it will be a walk-in cooler, and behind it the brewery, classroom, and storage. The goal is brew 2-3bbl batches for us to experiment with hop, yeast, grain, and water variables. This will be a great way to experience the many options that we as homebrewers have available for us. It will also be a great way to compare specific techniques etc… We hope our size will be small enough to allow flexibility, yet large enough to keep up with demand. As far as the overall process goes, we cannot say for sure now. The 30 day period for submitting a protest has passed (sorry if you missed it), but we have not heard back whether or not we have any complaints to deal with yet. Our last conversation with the ABC went something to the tune of, “don’t call us, we’ll call you.” So for now we wait. Needless to say we are all extremely excited and anxious as we await further details. Come in to check it out, for we will be happy to share our goals/vision for the space. We’ll keep you posted here as well.